Black 8 traps White 7 in a ladder. Note the play at is correct, as it protects and with tiger's mouths. If White has no ladder breaker, this becomes a perpetual Ko threat for White; therefor Black should eliminate the ladder at earliest convenience. Further, development down the line can bring a struggle by which White places a ladder breaker with a secondary function, which forces Black to choose; obviously, all rules of ladders apply here, and not killing a ladder presents a risk. You can also protect the top by a net, sacrificing the bottom. If White peeps at , Black can connect at A or capture-and-connect at B. A White peep at B creates an even worse situation, leaving Black a way to extend out a little and reduce White territory on either side. On the third line, this sequence kills White's invasion. If White plays A, Black threatens Atari and White B. White cannot create two eyes. 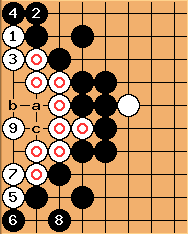 Here creates life: white at A or B produces 2 eyes, and likewise this is miai with 9 at B. Naturally, Black can't play in here to do anything but force the issue; Black can't even call this a Ko threat. Thus, at the fourth line, White can live. 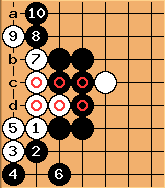 Black should protect the edge side when threatened in this shape near the center. This is worth 30 points roughly. This shape inverts the wide bamboo joint, turning two iron pillars and a diagonal into a solid connection covering 8 rows. The strengths and weaknesses of this particular shape may reveal interesting fuseki: the 3-5 point could indirectly protect the side point.